Home News & Prisoner Pages Why should free workers care about prisoners? 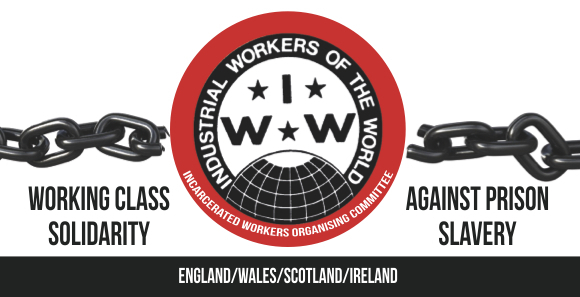 Great article by IWW member Sean Swain in Ohio, USA. –While the majority of prisoners committed crimes to end up in prison, we have to keep in mind that the extremely wealthy who control the “commanding heights” of the economy have created desperate situations that lead to crime. Poverty, crumbling schools, widespread unemployment and under-employment– these are all conditions created by a maldistribution of wealth and power. Prisons, then, are a way to punish those without opportunities; prisons punish those effected w a free pass to the wealthy who are the cause of crime. — While the vast majority of prisoners commit crimes to end up in prison, we also have to keep in mind that government has criminalized just about every human activity. The U.S. has more criminal statutes than any other nation in history. As a consequence, selective enforcement of these laws in poor areas where police are most heavily concentrated serves political, economic, and demographic interests totally unrelated to crime or crime control. The more “radical” element who may pose a challenge to the wealthy and powerful is silenced and neutralized while more wealth and power is concentrated in fewer and fewer hands. –Those in prison today are your neighbors tomorrow. Freed prisoners won’t live in gated communities with Fortune 500 executives; freed prisoners move in next door to you. As a practical question, do you want a fellow worker with community activism and labor organizing experience moving next door and using those skills to create a functional life, or would you prefer a bitter, desperate, unemployable criminal with no prospects and little or nothing to lose? — The modern prison system is the government’s “canary in the coal mine.” All of the strategies and tactics for surveillance, crowd control, and population pacification have been perfected on prisoner populations before being employed in the free world. Mass surveillance including centralized monitoring via security cameras and the collection of communications meta-data originate in prison; response tactics such as the use of tasers and pepper spray, “kettling” unruly mobs, and formations of phalanxes behind riot shields all arise from corrections applications.Even the use of torture was employed on prisoners before going mainstream. How authorities have pushed prisoners is soon how authorities push the workers. So, the conditions that prisoners are allowed to suffer today become the conditions imposed on workers tomorrow. Personal feelings about crime aside, the interests of workers and the working class are bound together with the interests of prisoners. In fact, those who truly would like to see crime diminish should work for prisoner-worker solidarity, empowering prisoners and expanding the labor market, widening opportunities and prosperity that pose as a real alternative to crime. * Let us know your ideas! !